Very Rev Dr Russell Barr, a member of the government’s Homelessness and Rough Sleeping Action Group, said its recommendations represented an “important first step”. 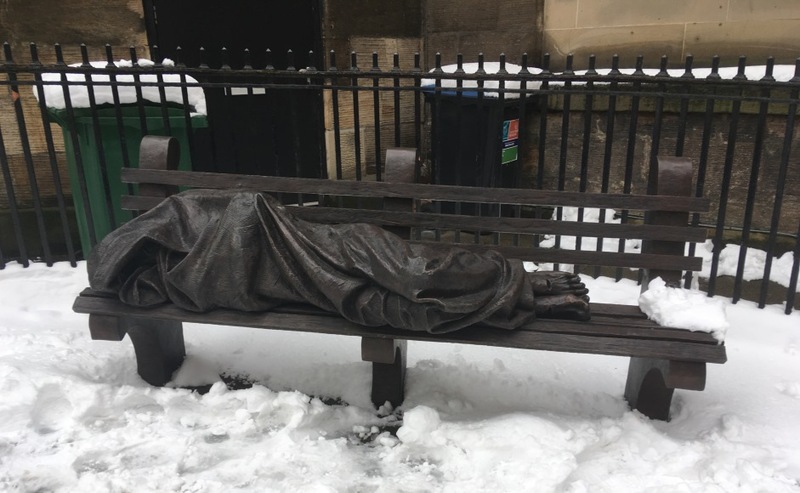 This image of Homeless Jesus in Glasgow surrounded by snow powerfully illustrates the scourge of rough sleeping. Image by Kathrine Stokes. The measures accepted by Housing Minister Kevin Stewart include a national system of rapid rehousing, involving integrated support from frontline outreach services and local authorities. The Scottish Government will now provide a further £150,000 to continue to provide some services to the summer, while the latest recommendations are taken forward. 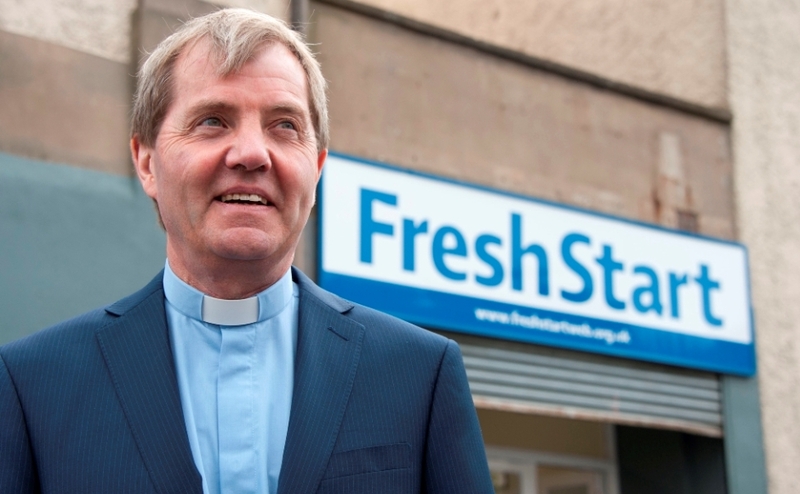 Dr Barr, who set up a charity in Edinburgh called Fresh Start in 1999 to help people who had been homeless turn a new tenancy into a home, said: “I am delighted that Mr Stewart has accepted our proposals and provided funding to ensure the recommendations are put into action. 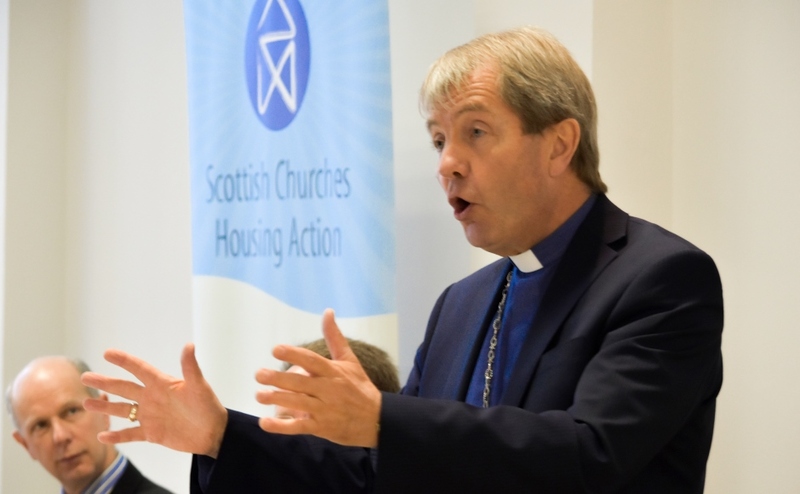 “This is an important first step on what I hope and pray will be a series of co-ordinated efforts to end the blight of homelessness in 21st century Scotland. “Although it only represents the tip of the homelessness iceberg, the sight of people sleeping rough in shop doorways and park benches is awful beyond words. “As everyone who took part in Social Bite's 'Big Sleep Out', last December in Edinburgh's Princes Street Gardens, one night spent in the freezing cold was bad enough. Dr Barr used his time in office as Moderator (2016-17) to campaign for an end to homelessness. Mr Stewart said: “As we come out of a particularly bad winter period, the action group’s work so far has been vital in ensuring front-line staff are supported and that people are helped to move into safe and warm places to stay. “Additional funding will allow the work that has taken place in our main cities to continue while we take the group’s hard work forward. “I was extremely impressed by the fast and effective work of organisations supporting those sleeping rough during last week’s unprecedented and extreme winter weather and want to thank everyone involved for the work and commitment they have shown. Action group chair and chief executive of Crisis UK, Jon Sparkes, said no one in Scotland should have to endure the "danger and indignity" of sleeping rough. “The members of the action group have gone above and beyond to dedicate themselves to bringing forward the right recommendations that will have the biggest impact on the way people sleeping rough can access and receive services," he added. Mr Sparkes said rough sleeping in Scotland can be ended. “Other countries and cities around the world have done it, so we know it’s possible,” he added.